No disciplinary field develops in isolation from its political, social and cultural environment, and demography is no exception. The first advances in population studies were achieved thanks to the individual efforts of scholars from different backgrounds: political writers like Botero, merchants like Graunt, astronomers like Halley and Wargentin, clergymen like Süssmilch and Malthus. Later, in the 19th century, with the development of statistics, Quetelet, Farr and Lexis – among others – shaped the contours of the discipline, which was enriched on a regular basis by the results of population censuses and the collection of vital statistics, as well as by closer and systematic contacts among scholars. This growing body of knowledge attracted the interest of sociologists, economists, and scholars of other social sciences – even biomedical experts. In general, however, it remained at the periphery of these disciplines. The study of population needed specialists, the development of coherent analysis methods, the creation of an autonomous discipline, the formation of specialized institutions, with dedicated chairs, research centers and scientific associations. This process was initiated in the 1920s and 1930s, and the IUSSP (initially named the “International Union for the Scientific Investigation of Population Problems” and referred to hereafter as “the Union”) was founded in 1928. The population conferences in London and Rome in 1931, in Berlin in 1935, and in Paris in 1937, attest to the scientific progress of the discipline, to the strengthening of the methodology, and to the depth and breadth of the participants’ interests. However, this process of growth – and the life of the newborn IUSSP as well – was marred by the interference of politics, by the influence of ideologies, by unhealthy scientific partisanship and, ultimately, by the catastrophe of the Second World War. Before the war, the Union was a federation of national committees, not of individual scholars, and this was a major weakness: it increased the risk of political interference in the life of the association, and was a divisive factor among individual researchers. In 1947, the new Union was reestablished as an association of individual scholars who were free, in theory, from political manipulation and interference. These pages are dedicated to the life of the Union during the half a century or so between its reconstitution in 1947 and 1994, when the United Nations organized the Cairo International Conference on Population and Development (ICPD). I will not cover the last quarter of a century because many of our readers are familiar with the most recent developments of international demography. Some of them have been important actors on the demographic scene and could talk about the Union better than me. In a first phase, between the 1947 and 1969, when the General Conference was held in London, the Union gradually built up its international profile and its administrative and organizational autonomy. 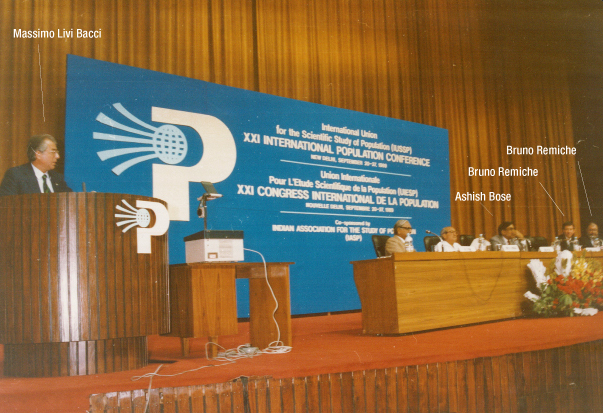 International meetings were held every other year, but the first five of them (from 1949 to 1957) were special – although independently organized – sessions of the ISI Conferences (International Statistical Institute). In 1959 and 1961, the meetings in Vienna and in New York were autonomous initiatives, while in 1963 the Ottawa Conference was again held under the ISI umbrella. The large conferences held in Rome (1954) and Belgrade (1965) were joint initiatives of the Union with the United Nations, which, despite its active involvement in population questions, preferred to remain in the background, leaving the debate in the hands of individual scholars and experts. In the late 1960s, the Union reached full autonomy, having built a recognized international reputation. It established permanent independent headquarters in Liège, and functioned according to well-tested protocols, including constitutional rules governing the election of its members and officers. A General Conference was held every four years, the Council established scientific Committees with well-defined mandates, and other less regular activities were carefully planned. During this period, demography advanced under the impulse of several driving forces. The first was the full realization by the international community of the extent of the acceleration of world population growth and, therefore, of the need to better understand its causes, mechanisms and consequences. One important achievement was the organization of census rounds every ten years, with shared protocols that ensured the comparability of results. The population explosion (or time-bomb, or boom, to use the militaristic vocabulary of population change) generated growing interest in the analysis of relations between population growth and social and economic development, and in the design of policies to control such growth, particularly in developing countries. There were also worries about the sustainability (although different words were used at that time) of population growth, and the possible exhaustion of basic resources, such as food, water, energy and minerals. The role of demography as a discipline became central for the comprehension of such complex questions; it was necessary to improve analysis methods; to reinforce, expand and integrate data collection systems; and to extend the analysis to countries and regions that had remained at the periphery of research. The Union played an important role in responding to the new challenges. In 1954 and in 1965, the Conferences co-organized with the United Nations were important steps in building international awareness about the political, economic and social relevance of population issues, highlighting the urgent need for appropriate expertise to address these issues. While the international meetings held before the war were essentially “Western” events in terms of their participants and the topics presented, scholars from the “Third World” – an expression coined by Alfred Sauvy – were now making their voices heard; their number grew rapidly and so did the quality of their contributions. At the 1954 Rome conference, one in five participants were from Africa, Latin America or Asia, while in 1965 in Belgrade, the proportion was one in three. Topics such as family planning, methods of analysis with defective or incomplete data, demographic aspects of savings, investment and technological development – and the strong focus on developing countries – attest to the transition of demography from a peripheral and ancillary discipline to a well-defined field of study, offering a growing body of knowledge that was key to our understanding of society. In the 1950s, scholars were essentially professors in the fields of economic, social and political sciences (including statistics) or specialists who worked in research centers dedicated to the same disciplines or belonged to government agencies dealing with planning, census-taking or vital statistics. There were no professorships in demography, and few would have described themselves as “demographers”. Things changed rapidly in the following decades. At the same time, the research focus of individual scholars, dedicated institutions, and international organizations shifted rapidly towards the developing world, whose rate of population growth peaked at the worrying pace of about 2.5 percent per year in the 1960s and 1970s. The governance and the Union’s activities readily reflected, but also guided, the general shift in attention to developments in non-Western countries. Before 1969, the Presidents of the Union were illustrious European and American scholars (Hersch, Landry, Mortara, Lorimer, Sauvy, Glass, Vogelnik), but in 1969, Chidambara Chandrasekharan from India was elected President (with a four-year mandate), followed by Carmen Miró (Panama) in 1973, and Mercedes Concepción (Philippines) in 1981. Each continental region was represented by an elected member on the Council of the Union (board of directors) where the major scientific and administrative decisions were taken. The Union still had solid foundations in Europe, and from 1966, led by an Executive Secretary,  it moved into small but permanent headquarters in Liège (Belgium). A Secretary General and Treasurer – a European for the sake of proximity to the headquarters – was in charge of transforming the Council’s directives into practical activities. Union members went through an election procedure based on their scientific and professional merits, and membership climbed almost tenfold from a little over 200 in 1951 to close to 2,000 in the early 1990s, with an increasing presence of scholars from less developed countries (LDCs), who nonetheless remained a minority. During the 1969-1994 period, the Union’s activities were very intensive. They included the planning and organization of the General Conferences every four years, costly events bringing together up to 1,000 experts; the organization of the Regional and of the Special Conferences, and of the many Seminars and Workshops organized by the Union’s Committees and Working Groups, established or renewed every four year by the Council (more on these below). Funds had to be raised; venues for the events had to be chosen in cooperation with the hosting country and institution; scientific programs had to be designed and participants invited: the quantity and quality of output was impressive. Not everything ran smoothly. The Union acts under a constitution that, notwithstanding adaptations, calls for relatively rigid procedures and protocols. This gave rise to competition between a somewhat rigid modus operandi (particularly for the General Conferences and other big events) and the need to incorporate the new cutting-edge research, to recruit the most qualified experts, and to cooperate with the best institutions. However, the Union’s priorities were also to disseminate knowledge, to promote the inclusion of left-behind countries and regions, to build bridges with other disciplines, and to ensure smooth collaboration with the growing number of national research centers and of international organizations whose main missions were not to produce original research. Aside from a fair amount of diplomatic compromise, a way was found to reconcile these competing viewpoints through the activity of the scientific Committees and Working Groups, which had considerable autonomy and flexibility in planning their activities, recruiting members, organizing seminars and meetings that, in general, were co-sponsored and co-financed by research centers and institutions hosting the various events. For instance, in 1988 (admittedly a record year), there were as many as 10 seminars on the following topics: Event history analysis, Biomedical and demographic determinants of human reproduction, Fertility transition in Asia, Collection of demographic data in Latin America, Medicine and the decline of mortality, Mortality in south-east and east Asia, International migration systems, Family in aging societies, Nuptiality in Sub-Saharan Africa, Theories of family change (plus a large African Population Conference, and another conference on Women’s role and demographic changes). 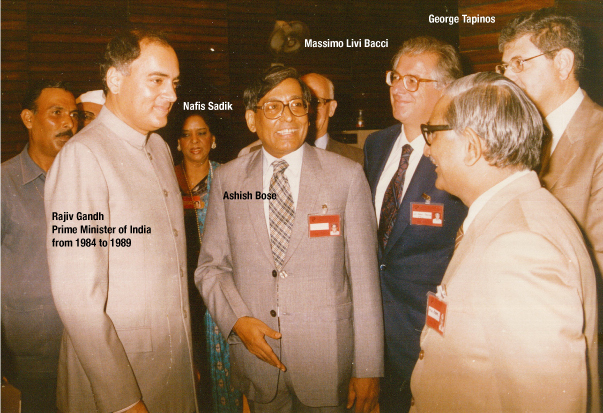 In the following four-year period 1989-1993, 22 similar events were organized by the Union. Another thorny problem was finance. Most international associations of scientists struggle with financial constraints. Autonomous revenues (membership dues, Conference registration fees, sales of publications) covered only a fraction of the Union’s general budget. Non-earmarked grants from Governments and other institutions, highly appreciated for the flexibility they allowed in spending, were unfortunately rare and small. Some donors were generous (first and foremost the UNFPA, created in 1969) in supporting activities that coincided with their missions and priorities. There were no problems in financing activities on topics like population and development, high fertility, family planning, maternal and child health, AIDS/HIV, gender issues… But financing the committees on historical demography, anthropology and demography, or meetings on issues pertaining to the developed world, was much more difficult. Maintaining a certain balance between “fashionable” topics and themes that lay outside the remit of the various donors proved hard to manage. The temptation was, of course, to “follow the money”, but on the whole, the Union has succeeded in maintaining a reasonable and honorable balance. I have touched upon the issue of expanding the membership of LDC scholars, and the (slow) progress achieved. But during the period under examination there were two major problems, concerning the USSR and its satellites on one hand, and China on the other. In the socialist bloc, experts were few, and participants in Union-sponsored events were often bureaucrats under an official mandate. A personal recollection provides a good illustration of the situation: on two or three occasions, the Union invited a well-respected Polish scholar who declined to participate, giving unconvincing reasons for his refusal. These invitations were reiterated until we were warned (of course, unofficially) that insistence on our part (a letter was also sent to the president of the Academy of Science) was dangerous for the person in question since his (purely intellectual) ties with the West had aroused the suspicions of the authorities. Another episode illustrates the attitude of China. Early in 1977, I had an interview in Paris with the Chinese Ambassador to UNESCO. I told him that the Council would be pleased to invite a delegation of Chinese scholars to the General Conference to be held in the same year in Mexico City. China, at the time, had begun sending students to doctoral programs in Western universities. The Ambassador listened to my words kindly and attentively, asking about several aspects of the Conference, and I thought that things were going well. But I realized I was wrong when he remarked abruptly “I have been informed that your association includes a few members from Taiwan and this fact makes it impossible for us to participate in the Union’s activities”. It proved fruitless for me to point out that the Union chose its members solely on their individual merits, and that Conference participants were individual scholars and not representatives of a nation. No Chinese scholars came to Mexico. Four years later, things had changed radically: at the General Conference in Manila there was a substantial Chinese delegation, and a special session was dedicated to the population of China, with papers presented by Chinese colleagues. In 1989, addressing the General Assembly as the newly elected President of the Union, I summed up the principles that I intended to follow, and I think those principles are still valid today, with the necessary adaptations to the new situation. Defense of the Union as an association of individual scholars who must not be subjected to lobbying by pressure groups acting on behalf of organized interests. Defense of the Union’s scientific prestige through the selection, planning and professional implementation of its scientific activities. Importance of building bridges with other disciplines: fruitful collaboration has been established with historians, anthropologists and researchers in the biomedical fields. Less satisfactory, for complex reasons, is our record with economics. More flexibility in the implementation of scientific programs. Importance of improving relations and dialogue with donors, reaffirming the Union’s independence and autonomy in deciding our scientific priorities, while submitting their priorities to serious analysis. Importance of responding to the request that the Union take some responsibility in the dissemination of knowledge. “Being an association of scholars, we are not very good at dissemination. Our timid attempts have not been very successful. And yet it is an important area; we have many things to say, many interesting results to communicate not only to other scientists, but to administrators and policy makers. It is a difficult area that requires professional skills that we do not have”. Have we made progress in the last quarter of a century? Have we kept our independence? Is our scientific prestige intact? Have we taken full advantage of the digital era? (Until the 70s, before the introduction of fax machines, communication about the international affairs of the Union was handled by the postal service, as in the 19th century.) Have we improved the dissemination and communication of our research? Have we developed interactions with other disciplinary fields? Recounting the recent and less recent history of our association, and comparing the present with the past, is a healthy exercise. On the history of the Union from 1928 to the end of the War, see the booklet prepared by IUSSP for the General Conference of Florence, in 1985, The IUSSP in History; see also L. MacKellar and B.W Hart (2014). “Captain George Henry Lane-Fox Pitt-Rivers and the Prehistory of the IUSSP”, Population and Development Review 40(4). Another reason for this choice of period is that in 1993, at the end of my mandate as President, I ceased to be directly involved with the IUSSP. Among them, past IUSSP Presidents (José Alberto Magno de Carvalho, Jacques Vallin, John Cleland, Peter McDonald, Anastasia Gage) or Secretary Generals (Allan Hill, Wolgfang Lutz, France Meslé, Nico van Nimwegen). Geneva 1949; Washington 1951; Rome 1953; Petropolis 1955; Stockholm 1957; Ottawa 1963. London 1969; Liège 1973; Mexico City 1977; Manila 1981; Florence 1985; New Delhi 1989; Montreal 1993; Beijing, 1997. Regional Conferences were also organized in cooperation with United Nations regional branches: Sydney, 1967 (with ESCAP); Mexico City in 1970 (with ECLA and CELADE). Alfred Sauvy was President of IUSSP between 1961 and 1963. “In each topical meeting, special attention was given to the problems of developing countries”, United Nations, World Population Conference, 1965, Vol. 1, Summary Reports, p. 1. Ansley Coale, USA, was elected President in 1977. 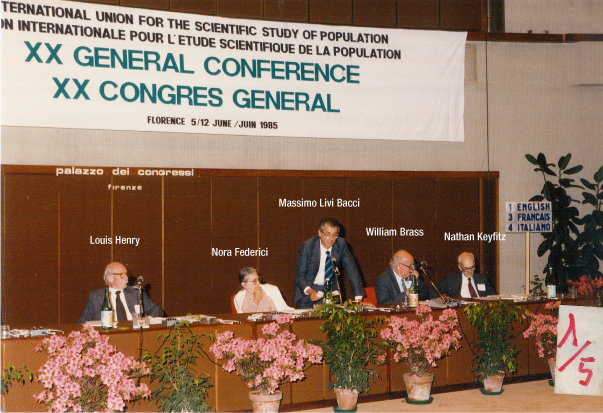 William Brass (UK) and Jack Caldwell (Australia), who served as Presidents in 1985-89 and 1993-97 had devoted a large share of their scientific career to research on developing countries. I myself (1989-1993), on the other hand, had worked mainly on historical topics and on the demography of contemporary Europe. Bruno Remiche from Belgium was Executive Secretary from 1969 to 1995. In 1981 The Union acquired the building that housed the headquarters in Liège. Eugene Grebenik was Secretary General in 1965-1973; followed by me (1973-1981), Georges Tapinos (1981-89), and Allan Hill (1989-97). The General Assembly, convened only every four years, could also give general guidelines. In London in 1969, Liège in 1973, Mexico City in 1977, Manila in 1981, Florence in 1985, New Delhi in 1989, Montreal in 1993, Beijing in 1997. Regional Conferences in Sydney in 1967, in Mexico City in 1970, in Accra in 1971; Conference on Population and Economics in Helsinki in 1978, and Conference on The Peopling of America in Veracruz, 1992. I recommend that a directory of all the activities undertaken by the Union since its foundation be posted on the Union’s website. (A list of IUSSP activities – probably not complete – is available at: https://iussp.org/en/iussp-meetings-and-events). Besides, a special program could be launched in anticipation of the Union’s centenary to be celebrated in 2028, nine years from now. The three volumes of the Veracruz Conference of 1992 on the Peopling of the Americas, for instance, are already online, thanks to the effort of the Colegio de México (http://iussp.colmex.mx/descargar-volumenes). IUSSP, Newsletter n. 36, May-August 1989, pp. 5-6. IUSSP, Newsletter n. 37, September-December 1989, pp. 17-18.